Fender Princeton Model Lap Steel Electric Guitar, c. 1947, made in Fullerton, California, serial # A-458, natural finish, ash body, metal fretboard, black chipboard case. One of the earliest Fender string instruments, this Princeton steel dates to the first period of the Fender Electric Instrument Company after the departure of "Doc" Kauffman and the changeover from the K&F partnership. These early steels and amps are the genesis of the entire Fender operation, which was a small struggling local concern in 1947-8 with very limited production, making all of these first instruments quite rare. 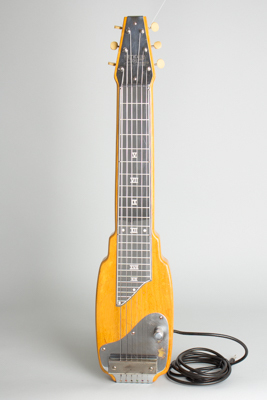 The Princeton was the least expensive of a three-model lap steel line, but the differences in the instruments were relatively minor. The lack of a tone control and a hard-wired cord are all that separate this model from its slightly more upscale brother the Deluxe, while the top of the line "Organ Button" model had a slightly more expensive pickup and a subtly different body. All of these early steels were made of whatever woods Leo had in stock; this one appears to be ash with a clear lacquer finish. These steels were built by fairly inexperienced workers and to a price -- the external work is relatively neat, but the internal routing is very crude. The pickup is the famous Fender "Direct String" unit, which is still considered one of the best-sounding steel pickups ever designed. The aluminum fingerboard carries stenciled Roman numerals designating the positions, and headplate has the inscribed "Fender Electric instruments, Fullerton California" lightning bolt logo. The original tuners are simple non-descript openback strips with plastic buttons. Despite its somewhat primitive appearance, this is a great-sounding, well-designed steel. Certain elements of the design are still carried over from the earliest K&F instruments, while others persist into the 1950s with the plastic-covered Champion steel. This Princeton carries an early serial number (#A458) and is both a good playing instrument and a fascinating historical piece, a tangible piece of the earliest days of Fender! Overall length is 28 3/4 in. (73 cm. ), 6 3/8 in. (16.2 cm.) wide at lower bout, and 1 3/4 in. (4.4 cm.) deep. Scale length is 22 1/2 in. (572 mm.). This instrument has survived in generally excellent condition with some typical wear and tear. The finish and metalwork have some scuffing and playwear, with some plating loss in a few spots. The fingerboard stenciling is well preserved with less loss than most, and the board plating is still bright and shiny. The top of the pickup and the control plate have more scuffing and a couple of worn spots through the plating behind the volume knob. The lowest tuner button has a crack at the base but is still functional; this could be easily replaced but we have elected to keep it all original for now. The wiring all appears original or at least period -- the single pot is dated to 1949 and is probably an early replacement; a large proportion of Fender's early output returned to the factory for service early on. The original hardwired cord with the military surplus phone plug is still intact. Many of these early "Direct String" pickups have failed and been rewound over time; this one does not appear to have ever been dismounted or altered, and as far as we can see remains original internally. The guitar still sounds fantastic with plenty of output and a powerful high-end response. Housed in a period chipboard case that is not a perfect fit, but we have seen with these steels before -- it may be a jobber style Fender bought as a surplus wholesale item! Excellent - Condition.